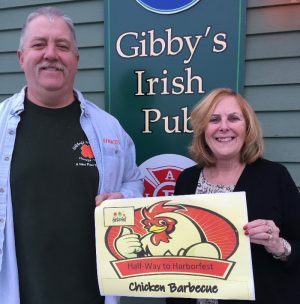 OSWEGO, NY – Oswego Harborfest will conduct a chicken BBQ on March 30 at Gibby’s Irish Pub. Gibby Thompson, owner of Gibby’s Irish Pub on the corner of Lake and West Second streets, has volunteered his cooking expertise and business to play host to the event once again. Pictured are Dave “Gibby” Thompson, Harborfest board member and owner of Gibby’s Irish Pub with Carol Dillabough of Harborfest. Fundraising efforts continue throughout the year and Oswego Harbor Festivals is happy to announce a second barbeque is planned. This great tasting chicken barbeque will run from noon – 3 p.m. with chicken, corn, salt potatoes and a roll all for $10 a dinner. Pre-Sale tickets are available at Gibby’s and at the Harborfest Office at 41 Lake St., open Monday through Wednesday, 9 a.m. – 4 p.m. The upcoming Oswego Harborfest dates are July 25-28.